Yes, you usually need experience to get a job. But often people apply for jobs because they need experience, and hope to get it by being employed. The conundrum is not as cruel as it appears, though. 1. These expectations may be overstated. You usually find the expectations for prior experience in the “requirements” or “qualifications” in a job ad. It’s usually a separate section at the bottom of the ad listening all the things the ideal candidate for the job will have or be able to do. Many candidates for the job are not going to have all of those qualifications, which often function more as a wish list than a realistic set of expectations. People who already have all of those qualifications (including years of experience doing the job) are probably seeking a job with more responsibility and higher compensation. Read the job ad carefully and critically before you decide that your lack of experience automatically disqualifies you. 2. 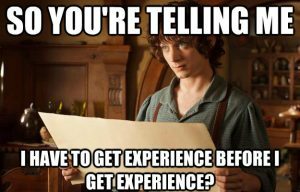 “Experience” is not the same thing as “years at a full-time job doing this same thing.” Particularly when you’re applying for an entry-level job, “experience” is a fluid category. Have you done similar kinds of work in an internship, part-time job, volunteer activity, or leadership position? You may not have the specific amount of experience they ask for, but you still have experience, and it counts. If you want to go into a career using your writing/design/editing skills, employers will want to see writing samples (or your portfolio) as evidence of your experience. Working on a campus publication, doing publicity for an student organization, getting a part-time communications job on campus, volunteering your skills to help a nonprofit improve their website all give you results that you can show to employers. Any kind of work experience can demonstrate your work ethic, responsibility, ability to manage your time, customer service skills — all of which will be relevant to future employers. It’s okay to start with food service and retail work. It all counts. Employers want people who can make things happen, see a project through to completion, work well with others, and solve problems on their own. As you get involved with campus activities and organizations, look for ways to demonstrate that you can do these things. Plan an event, raise money, organize a service project, recruit more members, create a new program. Projects count! If you’ve done some significant research, completed an independent creative work, made something cool with someone else, been involved in a college class project with real-world impact, employers will be interested. 4. Experience doesn’t always speak for itself. There are a lot of resources on campus to help you craft your resume so that the things you’ve done while in college are visible to employers as “experience.” Make an appointment with Kirstin Wilcox (call 333-4346 or stop by EB 100) to talk about your resume strategy, or make use of the resume review service at the Career Center. Bottom line: you probably have more experience than you think you do, and every semester offers opportunities to get more, even if full-time employment is a long way off. This entry was posted in career, internship, plan by KW. Bookmark the permalink.